Vero Beach, Fla., Feb. 5, 2017–This day 100 years ago, Congress mustered more than the two-thirds majority in both houses required to override President Woodrow Wilson’s veto of the previous week. It passed the Immigration Act, one of the rare times that Congress has overridden a Presidential veto. Congress has prevailed over fewer than one-tenth of vetoes. The law required a literacy test for immigrants and barred Asian laborers, except those from countries like the Philippines with special U.S. ties. The law went into effect May 1, 1917. During the late 19th and early 20th centuries, the United States received a majority of the world’s immigrants. Most seeking entrance continued to be accepted. Between 1892 and 1924, some 16 million people entered and settled in the United States to seek a better life, increasing the nation's population by 25 percent. In 1894, the Immigration Restriction League in Boston petitioned the U.S. government to legislate that immigrants be required to demonstrate literacy in some language. Congress passed such a literacy bill in 1897, but President Grover Cleveland vetoed it. 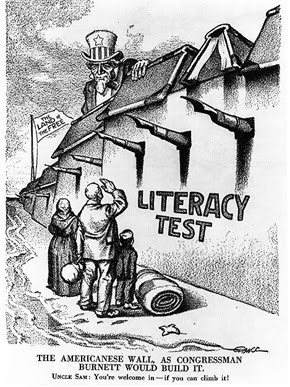 The Immigration Act of 1917 was the first federal law to impose a general restriction on immigration in the form of a literacy test. It also broadened restrictions on the immigration of Asians and persons deemed "undesirable” and provided tough enforcement provisions. The Immigration Acts of 1903, 1907, and 1910 added rules to exclude persons with mental and physical defects, persons with tuberculosis, and anarchists. However, literacy riders to the immigration laws were vetoed by Presidents Grover Cleveland (1896), William Howard Taft (1913) and Woodrow Wilson two years earlier (1915). The Immigration Act of 1917 updated and codified much of previous immigration legislation, repealing the Immigration Acts of 1903, 1907, and 1910. It contained 38 subsections and took up 25 pages in the Congressional Session Laws. Congress overrode Wilson's second veto of the proposed Act. Literacy Test, Higher Head Tax, More "Undesirables"
Besides adding this literacy test, the law increased the head tax to $8 (equivalent to $150 today), which was a significant barrier for impoverished refugees. The act expanded categories of "undesirable aliens” to include: "idiots, imbeciles, and feeble-minded persons;” persons of "constitutional psychopathic inferiority;” "mentally or physically defective” persons; the insane; alcoholics; persons with epilepsy, tuberculosis or contagious diseases; paupers and vagrants; criminals; prostitutes; anarchists; polygamists; political radicals; and contract laborers. The Immigration Act barred most immigration from Asia. Chinese immigrants were already barred by the Chinese Exclusion Acts and the Japanese by the Gentlemen’s Agreement. In addition, the act created the "Asiatic Barred Zone,” which encompassed India, Afghanistan, Persia (now Iran), Arabia, parts of the Ottoman Empire and Russia, Southeast Asia, and the Asian-Pacific islands. The act contained extensive provisions for enforcement. Penalties were imposed on any persons or corporations who encouraged or assisted the immigration of persons barred by the act or contract laborers. Disruptions caused by prior immigration in the first decade of the 20th century – nearly 8.8 million people in 1901-1910, adding one new American for every eight residents in the United States in 1900. In 1907 alone, 1.3 million immigrants passed through Ellis Island. Eugenics theories then popular that categorized individuals and races as superior and inferior. Adolf Hitler didn't write Mein Kampf in a vacuum. Nativist sentiments exacerbated by America's entry into World War I. The 1917 law slowed down the rate of immigration. But another 5.7 million immigrants were added in 1911-1920, and in 1920-21 the rate was back up to that of the first decade. In 1924 a more restrictive law was passed requiring immigrant inspection in countries of origin, leading to the closure of Ellis Island and other major immigrant processing centers. The immigration quotas begun in 1924 turned out to be more effective at controlling the numbers of new Americans.